Jim was born in Sacul, Texas as one of seven children to Curtis and Halle Mae Swink. "Wonderful people," is how he remembers his parents. Jim lived in the small Nacogdoches County community for his first "twelve or thirteen years" where his father was a tenant farmer and worked in timber. Jim moved to Rusk at age thirteen when his mother was taken ill with tuberculosis and spent about a year in the hospital. "I was pretty good in athletics as a young guy and a lot of people offered to put me up if I'd move to their town. They were recruiting people real early," he recalls wryly. In Rusk he lived with foster parents, Obie and Grace Walker, with whom he remained "very close." To earn income, Jim worked at a grocery store and a service station and as a janitor, while starring on the Rusk High School football team. Upon graduating in 1953, Jim, whom colleges heavily recruited to play sports, chose Texas Christian University and received an athletic scholarship. In his first football game against University of Kansas, he carried the football three times and scored two touchdowns. Jim majored first in geology, then switched to pre-med, completing studies at the University of Texas Southwestern Medical School in Dallas. Jim was drafted into the U.S. Army and entered active duty on February 1, 1966. After basic training at Fort Sam Houston in San Antonio he was sent to Fort Ord near Monterey, California, where he joined a hospital unit bound by aircraft carrier for South Vietnam. 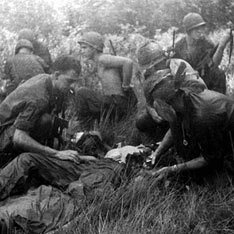 He was sent to Ku Chi, about forty miles north of Saigon, and the 12th Evacuation Hospital. It consisted of "six or eight of those long Quonset huts," and "twenty-five or thirty doctors in all," he recalls. Most patients remained at the hospital only briefly. Many, he says, "were shipped out pretty quickly to places like Japan, Saigon, and other facilities that could better take care of them. We did immediate debriding of wounds, amputations, and that sort of thing." Wounded usually arrived at the hospital within two or three hours. Jim often worked "two or three days straight" before a lull. "Then they'd have a big battle somewhere and you'd just work night and day," he says. He remained at the hospital for five months and then was sent to 1st Infantry Division and a base at Lai Khe. By then a captain and a member of a headquarters company, Jim went out on battalion-size operations in the field. Most, he recalls, were about two weeks in duration but one lasted for thirty-two days. While in the field, he was limited in medical care he could provide. "We can give them some pain medication and start an IV on them or very rarely maybe a system with their airway and breathing. You get them on a helicopter as fast as you can," he says. Fellow soldiers treated the six medics who worked with him "so special," he says. "They knew they were going to help them if they got injured." Jim spent seven months with 1st Division. He returned to the States in late August of 1968 and finished service at Fort Sill near Lawton, Oklahoma. After completing orthopedic training in Temple, Texas, he set up a practice in Fort Worth in 1971 with Charles Renshaw, a TCU classmate. Meanwhile, he earned a degree in ranch management from TCU, and worked with land and cattle during his leisure time. In 2005 Jim returned to Rusk where he works in the medical clinic at Rusk State Hospital. On December 27, 2005 he married Jeanie Leddon. He has three sons by a previous marriage.